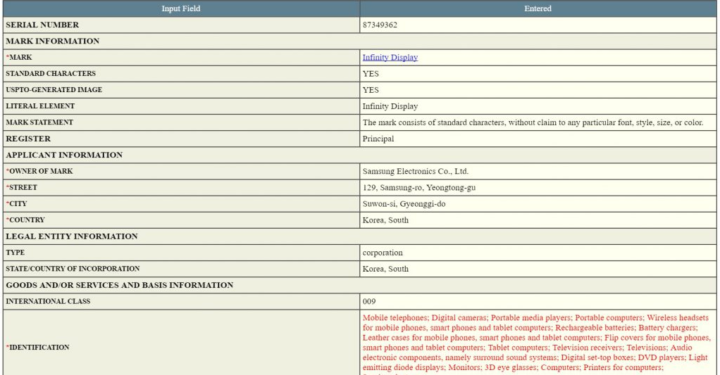 According to a recent USPTO trademark application, Samsung has settled on the ‘Infinity Display’ moniker, which we first heard about back in February, to describe the nearly full-screen curved panels that’ll ship on board the Galaxy S8 and Galaxy S8 Plus. Aside from a gorgeous edge-to-edge screen, the Galaxy S8 and Galaxy S8 Plus are also believed to be the first handsets to ship with Bixby, which will reportedly have its own physical button located on the left-hand side of the units. Display and now is the best. how with less cores, people have a quick phone? ‘Infinity Display’ , so do that means crack screen will not be a issue? Doesn’t Dell already call their displays like that as well? I really think this design looks good but unless your using a case you will constantly inadvertently touch the screen (edges) just by gripping the device. I found this on my S6 and S7 Edges, hence prefer using the clear case, does not add bulk but solves the touch issue. They call it “form over function”. My S6 edge+ on occasions has this problem. it completely disappears with a case, I agree. but without it, It is still great to use. I can only hope and assume that they are going to implement an enhanced palm rejection tech. Agreed. Aside from touch issues, narrow usable screen width, glare at the apex of each edge, image distortion and being prone to damage… Other than a case, one thing that would help with all of those known edge issues…. A curved display is certainly not as problematic as you suggest. I’ve been using the Note 7 for than 6 months and the only point I agree with you on is that it might be prone to damage if you drop the phone. Fortunately I’ve not dropped mine yet. One of the reasons I love my phone so much is the curved screen. Touch issues might be corrected through software tricks. Every other issue he listed can’t and is objectively true. Whether you choose to ignore them or not, it’s certainly up to you. Looks pretty. Who cares if it ruins the quality of the display and it’s annoying to use.